Ramati was a Redguard citizen whose family got more than they bargained for when they bought Frostflow Lighthouse. She wore a set of blue farm clothes and a pair of boots, and carried her husband's journal. 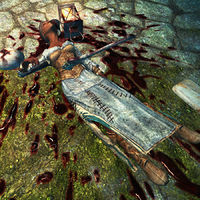 Her body is pierced by a Falmer war axe. Her journal is located in her room, and gives more detail on the family before their deaths. Her husband Habd saved for years before finally being able to live there with their children Sudi and Mani. For Ramati and Habd it was a dream come true, but their children weren't coping well with the move. She thought it was just her children messing with her when Sudi kept complaining of hearing scratching coming from the cellar. Ramati was the first to die when the Falmer finished tunneling through the walls. Her husband discovered her body upon returning from a trip to town and took off into Frostflow Abyss in search of his missing children. This page was last modified on 24 March 2017, at 21:00.